There is something that’s alive in New Orleans today that was already living when Genghis Khan invaded China and when Pope Innocent III not-so-innocently ordered the Fifth Crusade. The year was 1213. 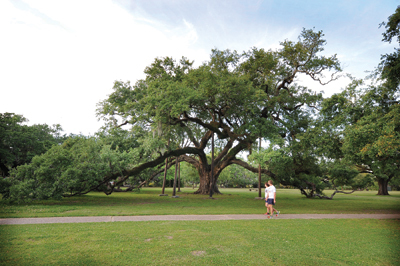 We don’t know the exact year when the sprout that would one day become the McDonogh Oak in City Park first broke through the ground, but arborists confidently date the tree as being at least 800 years old. In this issue when we search for discoveries throughout the city, nothing nears the sprawling tree for age and grace. What would be known as Bayou Metairie meandered near the oak’s birthplace. Because the bayou provided a water path, there were likely tribal people who might have rested against its trunk. Over centuries, tribal societies would evolve, and from that would come a group of people to be known as the Choctaws. Their history along the bayou would ebb and flow, but the oak still stood. New Orleans wouldn’t be founded for another 505 years when the oak was born. The republic in which the tree would stand wouldn’t declare its independence until 563 years later. We will never know how many ancient tropical events the tree has endured, but we do know it stood strong through hurricanes Betsy, Camille and especially Katrina, when its neighborhood was transformed into a deadwood forest. Now the McDonogh Oak is the centerpiece of what has become a splendid park. There are other historic oak trees in the area, though named with a sense of fatality, “Dueling” and “Suicide,” in contrast to the philanthropist John McDonogh. Where Choctaws once sought shade, so might an artist working with a sketchpad while being visually overwhelmed by the surroundings. No less impressive are the three limbs from which life not only continues but also spreads.